Deputy Attorney General Rod Rosenstein vowed the Justice Department would look into whether there was any wrongdoing in its Russia investigation. The Justice Department is broadening its internal investigation into the FBI's Russia inquiry after a top-level meeting at the White House on Monday with President Trump. Inspector General Michael Horowitz will be asked to look into "any irregularities" with the "tactics concerning the Trump campaign," said White House press secretary Sarah Sanders. Deputy Attorney General Rod Rosenstein, FBI Director Christopher Wray and Director of National Intelligence Dan Coats met Monday with Trump and White House chief of staff John Kelly. "It was also agreed that White House chief of staff Kelly will immediately set up a meeting with the FBI, DOJ, and DNI together with congressional leaders to review highly classified and other information they have requested," Sanders said. The top Democrat in the Senate questioned the propriety of such a meeting but said that if it occurs, it must be bipartisan. Senate Minority Leader Chuck Schumer, D-N.Y., said in a statement that the plan for the White House to hold the meeting "where 'highly classified and other information' will be shared with members of Congress is highly irregular and inappropriate" because, in Schumer's view, "the president and his staff should not be involved in the viewing or dissemination of sensitive investigatory information involving any open investigation, let alone one about his own activities and campaign." Schumer insisted that if the meeting is held, "it must be bipartisan in order to serve as a check on the disturbing tendency of the president's allies to distort facts and undermine the investigation and the people conducting it." The president has been on offense against Justice and the FBI following press reports that described the use of a confidential informant by investigators as they looked into Russian agents' overtures to Trump campaign aides in 2016. According to the reports, the informant met with Trump campaign advisers to try to learn more about whether they had relationships with any foreign governments. Trump and his supporters say the stories amount to suggestions that President Barack Obama's administration improperly spied on the Trump campaign. The allegations also follow an earlier charge, which was later deflated, that Obama ordered a wiretap at Trump Tower and that Obama-era officials may have improperly viewed intelligence that involved Trump campaign aides. Trump vowed on Twitter over the weekend that he would "officially" demand information from the Justice Department and the FBI about the early phases of the Russia investigation. Separately on Monday, Trump's ally Chuck Grassley, the Iowa Republican who chairs the Senate Judiciary Committee, said he wants more documents from the Justice Department about a figure connected to the infamous dossier about Trump that appeared publicly in early 2017. Grassley said he wants emails, phone records, notes and other materials by Associate Deputy Attorney General Bruce Ohr related to the former British intelligence officer Christopher Steele, who wrote the dossier. Steele was commissioned by a U.S. private intelligence company to research Trump's ties to Russia, and his work was underwritten by Democrats. People in the case have said that Steele was so alarmed by what he discovered that he volunteered to make his reports to the FBI. One of his contacts was Ohr, whose wife also was employed by the same political research shop. The Justice Department is already examining aspects of its Russia investigation, including its use of surveillance of people in the Trump orbit, and it said on Sunday that it would incorporate the president's request into that work. 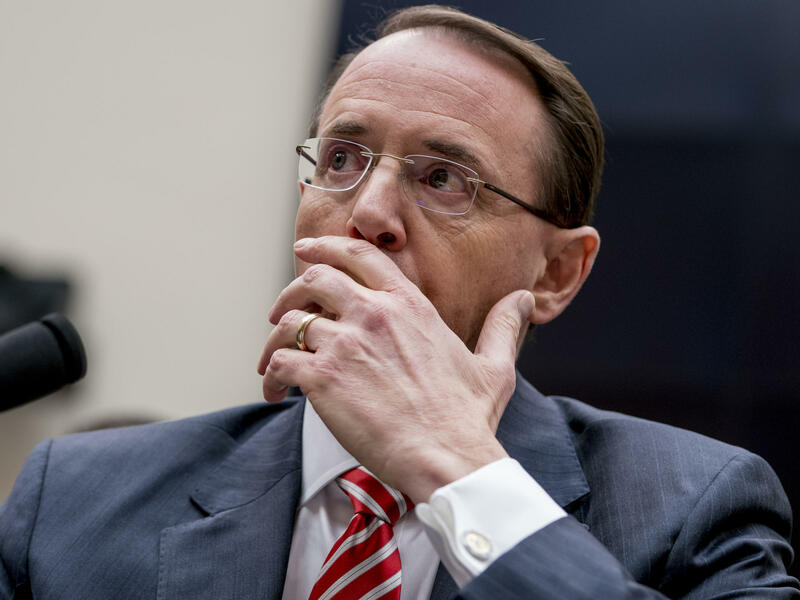 Rosenstein said in a written statement that the department would find out whether there had been any wrongdoing. "If anyone did infiltrate or surveil participants in a presidential campaign for inappropriate purposes, we need to know about it and take appropriate action," he said. Trump and Vice President Pence's re-election campaign alluded to their pressure on the Justice Department in a fundraising email on Monday: "This could be the greatest political scandal in American history," the campaign wrote to supporters. "I think at some point he made a decision that his case — whether that be the obstruction case or the conspiracy charges that involve Russia meddling in the election — that that's not going to be won in court," former U.S. Attorney Michael Moore told NPR on Monday. "And so he's made a decision to move the case now to the court of public opinion."